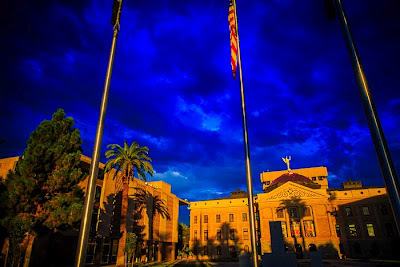 The old Arizona Capitol building on a recent morning. I was walking up to the Capitol complex to photograph an immigration vigil last week. It was right at sunrise and the Capitol complex, which faces due east, was lit up in the most spectacular way with a deep blue, almost surreal, cloudy post storm sky behind it. I made a couple of frames, the light changed and the scene was gone. It's a part of the ephemeral nature of photography that nothing stays as it is for very long. 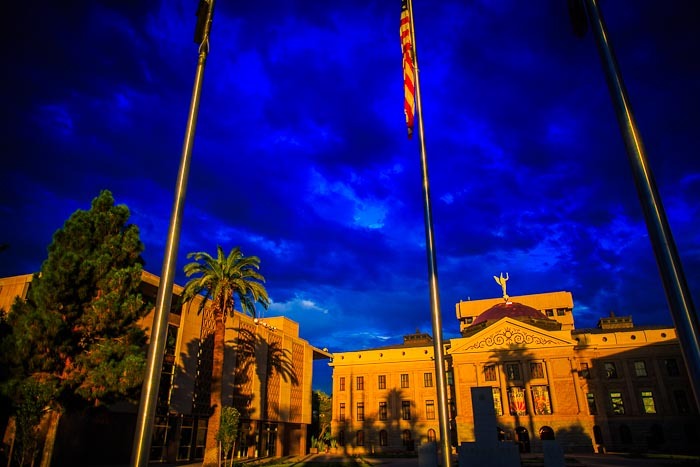 I've been to our state capitol hundreds of times in my 13 years in Phoenix. Usually in the middle of the day, when the light is pretty ugly. Sometimes early in the day, even at sunrise, but it was never lit up like this. There are more photos of the State Capitol (but nothing like this) in my archive.